Editor's Note: Stories like this might make you think the markets are rigged against you. But there are still ways to play if you have the right insiders in your corner. 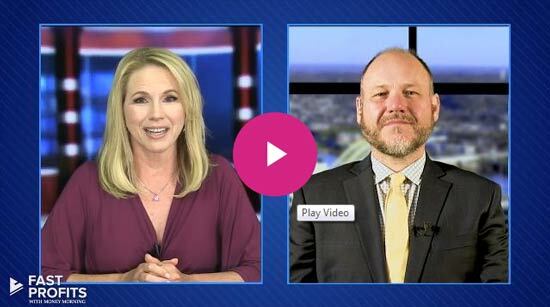 Get a behind the scenes view with our experts in Bill Patalon's Private Briefing here. Five of the world's biggest banks pleaded guilty on Wednesday to manipulating foreign currency rates for their own benefit. They will now pay a combined $5.6 billion in penalties. A sixth bank, Bank of America Corp. (NYSE: BAC), will pay $210 million after being fined by the Fed. Barclays Plc. (NYSE: BCS) will pay the most at $2.38 billion. Citigroup Inc. (NYSE: C) is second with a $1.27 billion fine. JPMorgan Chase & Co. (NYSE: JPM) will pay $1 billion, Royal Bank of Scotland Group (NYSE: RBS) will pay $670 million, UBS Group AG (NYSE: UBS) will pay $550 million, and Bank of America will pay $210 million. BCS, C, JPM, and RBS pleaded guilty Wednesday to manipulating prices for U.S. dollars and euros. According to The Wall Street Journal, that's a $500 billion-a-day market. UBS pleaded guilty for manipulating Libor – the London Interbank Offered Rate, or the rate the world's biggest banks charge each other for short-term loans. Bank of America didn't face the same probe from the Justice Department, but will pay a $205 million settlement after the Federal Reserve found the bank was using unsound practices in foreign exchange. 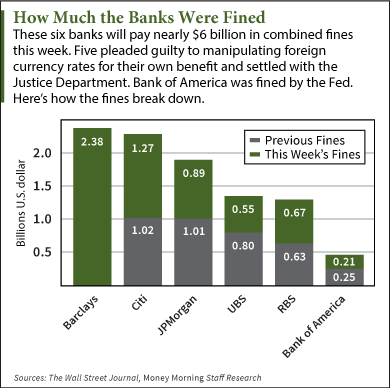 With this week's settlements, big banks have now paid more than $60 billion in fines over the past two years. Criminal actions have included tax evasion, manipulative trading actions, and mortgage load issues. "Now we know all the big banks are above the law," Gilani said. "They are convicted, they admit their guilt, and no-one goes to jail, they just pay more fines." "'Too Big to Fail' banking is just a superhighway toll road paved with manipulation, fraud, and criminality that leads to egregious profitability." Gilani points to UBS's non-prosecution agreement with the Justice Department as a sign that the U.S. government is acting like a toll collector to the big banks. No real damage is done to these banks, allowing them to continually pay the government for their nefarious behavior. What a joke the fine is. This is a mere fraction of the amount of money these banks have made by manipulating the market and why no jail time. We only prosecute the innocent her in the states and let the biggest criminals just pay fines, get used to it for it will only get worse until the revolution takes place . Lets hope someone gets that organized before it's to late! our food prices and all other commodities skyrocket , as a result and the rich banks pay with a smile,they must send the team who work this through to life imprisonment. My main question: How can the C.E.O. of a large Corporation also be the President of the shareholder's board? This is a serious situation and I would appreciate deeply hearing back from you.Thank-you in advance.